April 15, 2012 --This year’s annual Bluebell Festival at Merrimac Farm (and my first) turned out to be a great experience even though the famous bluebells were past their peak due to the unseasonably warm weather. As such, there was a greater focus on wildlife and history. “I got to hold him. He’s cool!” said 7-year-old Jason. Dad nodded in agreement, but Mom wasn’t so enthusiastic. PWCA provided a live animal display of aquatic and other critters, including a five-lined skink, some very fat bullfrog tadpoles, cricket frogs and a very friendly and active box turtle that mesmerized the children. Co-sponsor, Virginia Dept. of Game & Inland Fisheries had a popular display of animal pelts and skulls. Lisa Matthews of the Broadlands Nature Center (Ashburn, VA) brought Alvin (mentioned above). NatureBridge, whose mission is to connect youth to the natural world, conducted a hands-on, interactive hike exploring of Merrimac’s habitats and wildlife. Hikers were provided field microscopes and other tools for a closer look at what fascinated them. Other displays were set up by the Prince William Wildflower Society, Friends of Potomac River Refuges, and the Audubon Society of Northern Virginia. The Historic Prince William group was selling maps and books about local history. There was a Nature Art Show featuring local artists and photographers Scott Bush, Julia Flanagan, Ernie Sears, Steve Tabone, and James Gallagher. There were hikes for photographers, hikes to discover the best places to find birds and butterflies, and hikes to identify native plants – in other words, something for everyone! We had a bright, sunny day for the festival, although a frisky breeze played havoc with our tabletop signs. With all of the human activity, there wasn’t a lot of spontaneous nature making itself obvious to us, but we did see a shiny 4-foot long black snake in the morning and again in the afternoon. There were also titanium-colored skinks climbing trees and five-line skinks sunning themselves in the front flowerbed. The conservation landscape project behind the stone house is showing its spring colors, with pink dogwoods just finishing blooming, and trillium, columbine, and tiny iris in bloom. If any of you out there like to pull weeds, the garden needs you! At the very end of the day, Kim Hosen, et al., held the drawing for the rain barrel painted by local artist and PWCA member Jim Gallagher. Kathy Madsen was the lucky winner. For more information about PWCA events, go here. Tours last about 90 minutes and take an easy one-mile walk through the floodplain. Each tour has a special focus, although leaders will cover other interesting sights you encounter along the way. Bring binoculars, cameras and the kids! 11:00am NatureBridge, Especially for Families A hands-on, interactive exploration of habitats and wildlife. Everyone can use field microscopes and other tools for a closer look at what fascinates you. 2:00pm NatureBridge, Especially for Families A hands-on, interactive exploration of habitats and wildlife. Everyone can use field microscopes and other tools for a closer look at what fascinates you. Concessions and food will be available for purchase. Bring your kids, cameras and binoculars for the Annual Bluebell Festival at Merrimac Farm Wildlife Management Area! Appropriate attire for Merrimac Farm is always sturdy shoes and long pants, no matter the season. Click HERE to read more about Merrimac Farm. 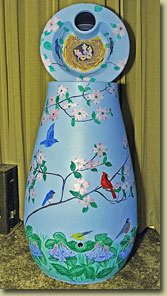 Congratulations to Kathy Madsen, winner of the fabulous rain barrel handpainted by local artist James Gallagher. Tickets are $5 each or 5 for $20. Proceeds benefit stewardship projects at Merrimac Farm.